Aim: To study the functional and morphological characteristics of organic and inorganic tomatoes. 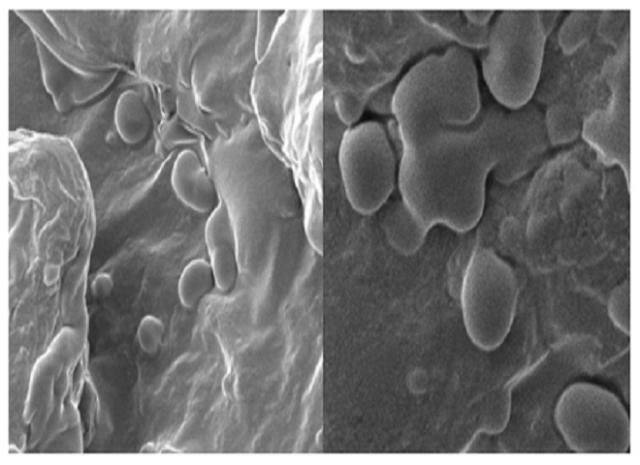 Methodology: UV treated, and untreated organic and inorganic tomato powdered samples were assessed using an analytical technique FT-IR and SEM. Results: FT-IR spectra of organic control samples showed peaks at (3290.12, 2924.72 and 1611.61 cm-1) while, organic treated samples revealed some peaks at (3287.11, 2925.66 and 1612.91 cm-1), inorganic control tomatoes confirmed the peaks at (3289.47, 2925.76 and 1619.26 cm-1) and in inorganic treated tomatoes peaks was at (3289.42, 2925.34 and 1619.31 cm-1) respectively, on confirming the presence of O-H, C-H, C=C, C=O and C-OH functional groups. However, results confirmed slight changes in functional groups of organic and inorganic samples and UV treatment helps in decreasing the effect of fluoride, chloride and other synthetic chemicals level by disinfecting the samples. SEM micrographs showed non-significant changes with minimal effect of UV in all samples. Conclusion: The outcome of the study helps in effective understanding of functional and microstructural differences between organic and inorganic tomatoes. Shankar SM, Nair SV, Duragdevi M, Yadav BK, Saravanan S. Functional and Morphological Studies of Organic and Inorganic Tomatoes. Pharmacognosy Journal. 2018;10(4):715-719.